For A Palestinian Father, Six-Day War Led To A Divided Life : Parallels After the war, Omar Omar was stuck in Jordan. He made a new life in the U.S. and sent back money to help his family. Now when he returns to the West Bank, where he was born, he sees it as an outsider. Omar Omar outside his family's home in the village of Deir Jarir. 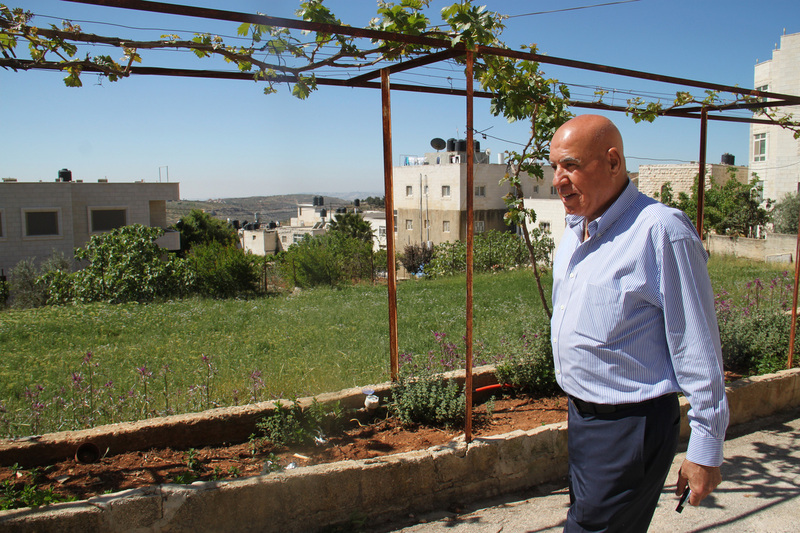 After living in the U.S. for decades, he sees the West Bank with the eyes of an outsider. This week marks the 50th anniversary of the Six-Day War between Israel and its Arab neighbors. This is one of two stories examining how lives were changed by the war. When Israel captured the West Bank in 1967, Omar Omar was stuck. He was 16 years old, going to a high school in Jordan, while his parents were back home in the West Bank, a few hours' drive away. Israel and neighboring Arab states had gone to war, and in six days, Israel won. It occupied the West Bank, and does so to this day. Like most other Palestinians who were away from home or who fled during the war, Omar couldn't get Israeli permission to move home afterward. A few months after the June 1967 war, Israel took a census of Palestinians in the West Bank. The majority of those who were not present at the time were not allowed to resettle in the West Bank, according to historians. "Many times, I tried," said Omar, now 66. "If you weren't counted during war, you are not from here anymore. You are not Palestinian. Despite your father, your mother, your family – no. They consider you not from here." According to Israeli historian Neve Gordon, about 200,000 Palestinians fled or were expelled from the West Bank during the war, and Israel ultimately allowed only about 17,000 of them to return. But Palestinians who were abroad when the war broke out — like Omar — were not allowed to return to the West Bank after the war ended. For those who were in the West Bank after the war, life was gradually met with restrictions. Since 1967, as hundreds of thousands of Israelis have settled in the Israel-controlled West Bank, Palestinians have faced life under military occupation. Over time, that has meant living with army checkpoints, road closures, nighttime arrests, and clashes with soldiers that can be deadly. In 1983, after more than a decade living in Jordan, Omar decided to head toward better fortunes — in America. Many enterprising Palestinians, both inside and outside the West Bank, sought opportunities in Jordan, the Gulf countries and in the West. Once he became a U.S. citizen, he could finally return to the West Bank a few times a year – as an American tourist. Now, after decades in the U.S., whenever Omar visits the West Bank, he sees it with the eyes of an outsider. This is the story of how Omar's life became divided. In the years when he was stuck in Jordan after the 1967 war, his family sent a cousin to Jordan to marry him. The couple had six kids, and Omar built a successful business importing clothing. 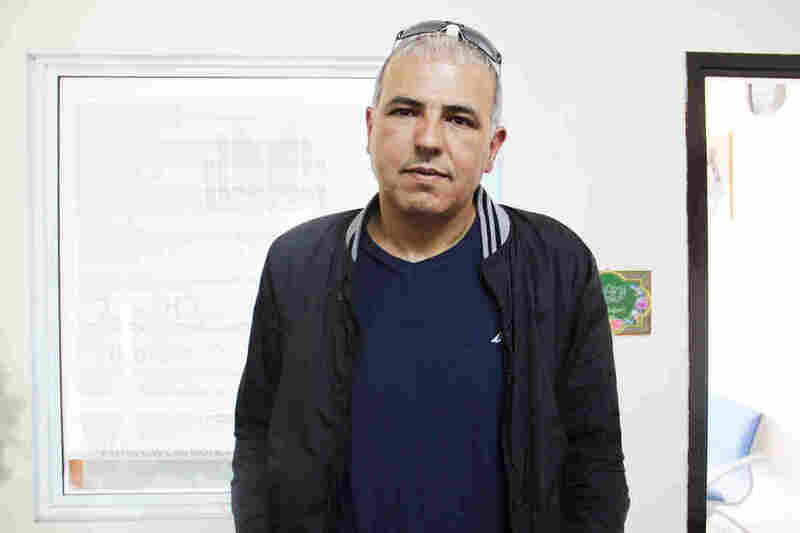 But money ran dry, so he sent his wife and children, who all had West Bank residency rights, to live with his parents while he tried his luck in the U.S. He became a limousine driver in New Jersey, and sent his family money. He lived a different life than they did. "I dealt with the Americans, high-educated people, executives," Omar recalls. "They don't look at you [as] black, white, Palestinian. They don't look at these things. They [are] fair people!" On one recent visit back to the West Bank, the two halves of his life collided at an Israeli army checkpoint. He was returning from a picnic when soldiers asked him to exit the car and raise his shirt, to check for explosives. "I told [them] I am not going to take it off," Omar said. "When you live 20, 25 years as a free person – full rights – you can't take these things!" The soldier started yelling at Omar. "So I look at the guy next to him, the other soldier," Omar continued. "I saw that soldier. And exactly, that jumped to my mind — this guy I know! This guy, I swear I know. I said, 'Aren't you from Fair Lawn?'" The soldier was indeed from New Jersey. Omar used to drive his family to the airport. And here he was, in an Israeli army uniform, ordering Omar to lift his shirt. "Don't you know me?" Omar asked the soldier. "Oh, I see, I see, I am sorry," Omar said the soldier replied. "What you're doing here?" Omar asked. "It's my duty," the soldier said. "Why do these things to the people?" Omar asked the soldier. Esmat Mansour, Omar Omar's son, spent 20 years in an Israeli prison for his part in the killing of an Israeli settler in the West Bank in 1993. "Go to the car. Just go, Omar. Go, go. Don't worry," Omar recalls the soldier saying. The soldiers let him go. Omar's most difficult moment came many years earlier, though — when his son, Esmat, was a teenager. Esmat, who'd grown up with his grandparents and mother in the West Bank, had seen the first Palestinian uprising, the Intifada of the late 1980s and early 1990s, up close. He had seen a kid in his West Bank village of Deir Jarir get shot and killed while throwing stones at Israeli soldiers. In 1993, Esmat and some others tried to kidnap an Israeli settler named Haim Mizrahi, who bought eggs at a chicken farm where Esmat worked. Mizrahi resisted. Esmat helped hold him down while an accomplice stabbed and killed him. Esmat spent the next 20 years in prison. Omar was in the U.S. working as a limo driver when he got word what his son had done. "It was the hardest days in my life. That day, when they call me, I had an accident in the car, limousine car," Omar said. "I don't know. Everything mixed up." Omar believes Esmat would not have done what he did if Omar hadn't been far away in the U.S.
"He would never do that. Because, if the father [is] in the house every night ... every day in house, I would be, like, supervising," Omar said. "I wish ... but wishes doesn't do nothing." Israel released Esmat Mansour from prison in 2013 as a goodwill gesture toward the Palestinians at the start of renewed, U.S.-brokered Israeli-Palestinian peace talks. Those talks collapsed in 2014. (Haim Mizrahi's mother, Mazal Mizrahi, declined to comment about her son's murder when contacted by NPR, saying it was still too painful to discuss). Today, Omar's son says he no longer believes in violence. But Omar rationalizes what Esmat did as a part of a never-ending conflict with Israel. "They [are] killing us, they [are] humiliating us. They are doing everything to make us less than human beings," Omar said. "What he did, when he was 16, 17 years old – why he killed?" His answer is that his son was caught in a cycle of violence. "What do you expect?" Omar said. "What do you expect?" With so many Israeli settlements dotting the West Bank, Omar thinks it is too late for Palestinians to establish their own separate country. Instead, he wishes Palestinians and Israelis could live as equal citizens of one democratic country. But he knows that is unlikely. Many Palestinians are still committed to independence, while many Israelis oppose granting millions of Palestinians citizenship in Israel, fearing that could lead to the end of Israel's Jewish character. Omar used to think he could help his family members most by sending them money. Fifty years later, he wants to send them to America.